The New Year is all about memories. Today I was finishing up lunch at Tatsis Restaurant, and 2 guys walk in. One guy says, “Hey, there’s the ‘HAT Man’,” and comes over and shakes my hand. Another good radio memory for the books, but this is one is different. After a few pleasantries, we got down to business. These gentlemen remembered me when I first came to WSOC (before BT) in the late 60’s. We even reminisced about Plaza Church in the Bill and Walter Johnson era. 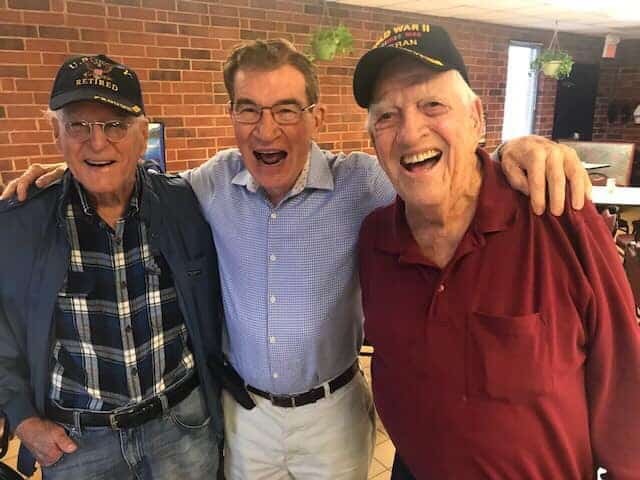 But here’s the WOW part of this connect — both these guys are WWII veterans. On the left, George Lineberry, US Navy, is 98 years old; Ed Messer, on the right, US Marines is 93 years old. I said, “Who drove you over here?” And they said…”The guy parking the car…he’s 86!” For a change, the youngster is in the middle. Happy New Year!